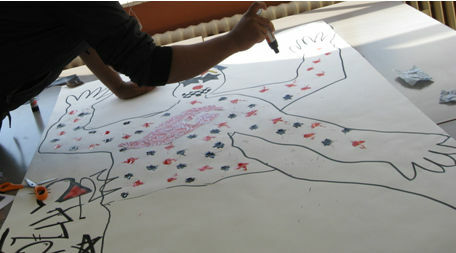 This paper reports on a study of visual autobiographies produced in art workshops conducted in a variety of social contexts in East London with 19 research participants 11 women and girls, 8 men and boys – ranging from 10 to the 50s. From narrative analysis of the images, associated interviews, and field notes on the production and exhibition of the images, the paper argues that the study of cultural activity can allow us to identify cultural-spatial positionings related to, but also distinct from, socio-spatial positionings. Those cultural-spatial positionings indicate and in some cases produce cultural and symbolic resources that might not be discernable from other non-visual research data, that may differ importantly from participants' socioeconomic resources, and that could usefully receive more attention. The study also suggests that transnationalism is strongly tied to people's narratives of their cultural lives within global cities, is critically articulated, and can be under-recognised when it is rooted in family. 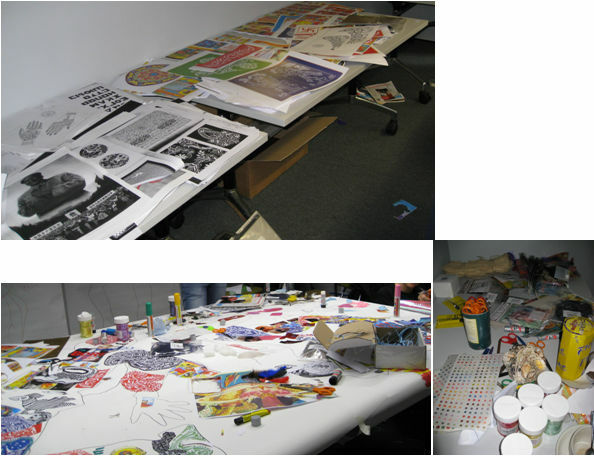 1.1 This paper reports on a series of art workshops conducted in diverse social contexts in East London. 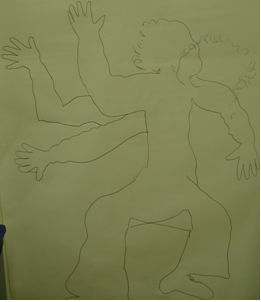 During the workshops, participants produced visual autobiographies. Later, they participated in interviews about them. The research aimed to investigate whether cultural activity of this local, non-professional kind, which happens often but which is somewhat under-researched, might display resources for urban living that are otherwise overlooked or difficult to see. It also aimed to examine whether such cultural activity might itself act as a resource for urban living. In addition, the research explored whether such resources relate to or are distinct from participants' socioeconomic positions. It started from the possibility that cultural activity of this kind, which produces activity patterns and visual materials as well as verbal data, might demonstrate cultural-spatial positionings and resources that are distinct from the socio-spatial positionings and resources emerging from interview and survey studies (e.g. Butler & Robson 2001). Finally, the study aimed to investigate whether, in a city embedded in global financial, social, political and cultural exchanges (Massey 2007: 184), transnational, as well as neighbourhood, urban and national connections, (Rogaly & Taylor 2009) might shape East London visual autobiographies. 1.2 Study objectives were thus to produce descriptions of some important but under-researched phenomena: cultural activities as indicators and generators of social, cultural and symbolic resources; relations between cultural positions and resources, and social positions and resources; and national and transnational as well as local and urban elements of 'living in East London'. It was hoped that these descriptions might have relevance for community activities and urban renewal policies, as well as for sociological thinking about community and urban resources, and about visual and activity-based research methods. 1.3 We pursued our research aims and objectives by facilitating and then analysing a particular cultural activity, the making and exhibition of visual autobiographies; by analysing the images themselves; and by analysing autobiographers' accounts of their images. The images were produced in three social contexts, a gallery, a cultural centre and a school support centre, in Spitalfields, East London, by participants ranging in age from 10 to their 50s, and of varying class and ethnic backgrounds. Burman, an artist who has previously conducted many community art workshops, including in Spitalfields, formulated and oversaw the four 'visual autobiography' workshops, which involved exciting large-scale image-making, using collage techniques that were accessible to all. The workshops were followed by research interviews about the images and image-making, and by the images' exhibition in a well-known local gallery. Field notes about and photos of participants' engagement with the image-making, the interviews, and exhibition, were the third aspect of the data. The project was conducted under the title, '"You are here": visual autobiographies of East London lives'. 1.4 London, as a 'global' or 'world' city, is an important node within densely connected international economic networks. Like other such cities, it is also characterised by high levels of international social, political and cultural exchange. Socioeconomic differentiations are intense and numerous within such cities; cultural heterogeneity is general (Massey 2007; Sassen 2001). Global cities' spatial integration of diverse lives, bringing people of many different social backgrounds together physically, is crosscut by divisions between how those lives are lived. People living side by side may have largely separate work, family and leisure lives. Is such social separateness mirrored in people's urban cultural lives? Socioeconomic class continues to have strong relations to reported and independently monitored patterns of cultural consumption in the UK (Bennett et al. 2006; Le Roux et al. 2008). This study examined whether such relations still appear when we investigate how people produce and understand culture within a global city. 1.5 Why look at local cultural activity of this kind? The 'cultural turn' in the sociology of class, particularly in feminist work, has foregrounded the importance of studying social lives through everyday cultural activities, for instance, through the material cultures and the narrativising of family lives (Smart 2007: 34). Moreover, cultural activities have been shown to have important effects on people's lives, independent of socioeconomic status, for instance, on how they evaluate their physical and mental health (Cuypers et al. 2012). London's 'Be Creative Be Well' initiative provides examples of the productive effects of low-resourced neighbourhoods' enhanced cultural involvements (Ings et al. 2012). In Tower Hamlets, the London borough in which Spitalfields sits, a longstanding sewing and education project appears to have positive effects on women's literacy, self-confidence and educational aspirations (Begum et al. 2011). As we were researching in an area celebrated for the diversity of its cultural life, it made sense to examine cultural resources by looking at how people there made, rather than consumed, cultural objects, and to focus on a form of cultural activity accessible to everyone, not specific to one social group. 1.6 Spitalfields has a history of, successively, French Huguenot, Jewish, Irish, Bangladeshi and Somali migrant settlement, and later outward movement of the more prosperous. Today, it is home or place of work to many well-paid financial, media and art workers, and a leisure destination for visitors from London, the UK and internationally. It exemplifies the gentrifying and authenticising urban processes described by Zukin (1989; 2011). However, many residents, workers and visitors, are less affluent. Tower Hamlets is the third most deprived UK region in social, economic and health terms, with economic inactivity reaching 46% and two-thirds of children living in poverty (Imrie et al. 2009). The visitor economy focused on Brick Lane (which bisects Spitalfields and is the apparent centre of Bangladeshi community life, as it was earlier of Jewish East End life) has not had generalised economic effects. Yet the social and cultural heterogeneity of East London is often presented as emblematic of London, and was a key factor in winning the city the Olympics. 1.7 Like many other urban centres of migration, Spitalfields has a strong history of radicalism and resistance, for example in response to fascist attacks on Jewish people in the 1930s and Bangladeshi people in the 1970s. Today, racist incidents are still numerous. Street crime, violence, and illegal drug use and sales are popularly but simplistically associated with 'gangs', a term widely applied, with uncertain and variable meanings, to young black and Asian men's social groups (Alexander 2008; 2000). In a changing linguistic environment, some older Bangladeshi-origin people perceive lack of English as excluding them (Rasinger 2007). Restrictive 'postcode' territorialities in this, like other socially disadvantaged UK urban neighbourhoods, are popularly decried, but often dismissed as internal, poor-on-poor conflicts (Pitts 2007; Scott 2011). In London's summer 2011 unrest, though Spitalfields saw some attacks and car burnings, and looting on its northern side, Brick Lane businesspeople organised a strong defence, and the area was not a centre of disturbance. 1.8 Recent popular representations of Spitalfields exhibit intense interest in its overlapping histories (see for instance Ackroyd 1995; Ali 2003; Gentle Author 2012; Lichtenstein & Sinclair 2000). Such work can be nostalgic about the past, prone to exoticising difference. Contemporary social research about Spitalfields constitutes an alternative, horizontal archaeology of its multiple, contested identities. This work focuses on young Asian men, the Brick Lane Bangladeshi community, social and political links between East London and Bangladesh and the divide between white working class and Bangladeshi-origin communities (Alexander 2000; Dench et al. 2006; Garbin 2008; Wilson 2006). Such work has not, though, except in Back's (2007) The Art of Listening, which draws on a street photography project in Brick Lane, started from 'non-expert' cultural activity, as other community-based research on urban lives has started to do (Kaptani & Yuval-Davis 2008; Luttrell 2010; 2003; McLean & Kelly 2011 and as we planned. 1.9 Different class, income, language, racialised, religious and national groups live, study, work, pray and socialise beside each other in Spitalfields, sometimes on the same street, with varying degrees of connection and conflict. How can such complex urban coexistence be understood? Butler and Robson (2001), studying middle class, mostly white Londoners, describe class tectonics in gentrifying urban areas: Groups with distinct levels and types of social and cultural capital live side by side, without much social interaction. There is, Butler and Robson say, 'something of a gulf between a widely circulated [middle class] rhetorical preference for multicultural experience and [middle class] people's actual social networks and connections' (2001: 2156). Similarly, people of all economic, social, ethnic and national backgrounds go to Brick Lane; it attracts UK and non-UK tourists, as well as visitors from all over London. These diverse groups interact with each other largely via consumption and contiguity. Yet white middle class visitors, workers and residents in this global city zone may still construct what Butler (2002) might call a 'Brick Lane of the mind,' characterised by conversation across diversities. Such a construction is not homogeneous, however. Many Bangladeshi Muslims, for instance, view Brick Lane as a workplace, a place for white people's entertainment, a public space unsuitable or difficult for women or as an over-nationalist, insufficiently Islamic project (Alexander 2011; Begum 2008; Garbin 2008). Socio-spatial tectonics here may be of gendered, ethnic and religious, as well as classed kinds. 1.10 These tectonics are likely to be cultural as well as social, for cultural and social aspects of urban life are intertwined. Butler and Robson (2001), for instance, note that the sites of social interaction that generate gentrifiers' mind maps of urban diversity, are often cultural. Brick Lane operates not just as a site of economic exchange and social interaction, but of the production, display and consumption of a particular, 'Banglatown' culture that affects visitors, workers and residents, of both genders and of all socioeconomic and ethnic backgrounds, though it affects each group differently (Begum 2008; Shaw 2011). Global cities are, indeed, part of knowledge, culture and art networks, as well as social and financial economies (Alexander 2011; Sassen 2001; Zukin 2011). In order to investigate people's lives in global cities, we therefore addressed cultural-spatial patterns of actions and interactions – aspects of urban life that are less often investigated than are socio-spatial actions and interactions. We studied these patterns in socially, economically and culturally distinct locations, with participants from diverse socioeconomic backgrounds, to try to understand cultural-spatial patterns' elations to socioeconomic status, and how such patterns might operate as resources for urban lives. 1.11 Because the research's main focus was cultural activity, we did not gather comprehensive data on cultural-spatial networks, so we cannot fully describe cultural- or socio-spatial patterns of action and interaction. Rather, we investigated people's cultural and spatial positionings (Davies & Harre 1990; Taylor 2009) of themselves, through the images they produced, interviews about those images, and their engagements in the art workshops, interviews, and exhibition. 'Positioning' can refer to the linguistic, visual or enacted expression of people's identities. While it is frequently associated with conversational interaction, it can refer to other kinds of discourse, that is, to any form of 'institutionalised… language-like sign systems' (Davies & Harre 1990). 1.12 The concept has built into it a recognition of the fluidity of people's positionings and of the identities produced by those positionings. We did not assume that single, coherent identities would emerge within the research. Rather, we expected that positionings would express numerous, shifting identities, or what Hall has called identifications, 'multiple and changing patterns of personal identity formation'. Hall further describes these patterns as 'aligned with and crossing social conjunctions, processes of becoming (that are) subject to the continuous "play" of history, culture and power' (Hall  1999: 394). Such alignments and contradictions are well, though complexly, accounted for in the concept of intersectionality (Crenshaw 2003; Phoenix & Pattynama 2006; Walby et al. 2012; Yuval-Davis 2006). Intersectionality suggests that subjects are placed at the meeting points of shifting, often conflicting axes of personal and group identifications, in this study, for instance, of social class, gender, ethnicity, 'race' and generation and of socially, politically and historically inflected cultural strategies of city living. 1.13 The larger sociological framework for this research draws on a concept found within Bourdieu's (1986) theory of forms of capital, though in many other theories also. By examining cultural-spatial positionings and intersectional identities, we study the resources, social, cultural and symbolic, as well as economic, with which people are living. We deploy the concept of 'resource' to denote means that we could discern within the research data as available to research participants to support their lives in global cities, including, at times, means developed through the research itself. Cultural-spatial positioning can both indicate these resources, and act as resources in themselves. 1.14 We do not use narrower concepts of social, cultural or symbolic capitals in this research because they seem too strong for our data. For Bourdieu, the term 'capital' applies to accumulations of sought-after, valued and productive resources. These forms of capital are interconnected, and can be converted into each other and into economic capital. We did not obtain full information about participants' resources, or those resources' value, productivity or convertibility. It is not clear that such information can be obtained. Moreover, there are many theoretical problems with the 'capitals' framework: its failures to address gender and ethnicity; its metaphoricity and reification; the uncertain divisions between forms of capital; the theory's difficulties in addressing the producers and owners of capitals, conflicts between them, and the state (Beasley-Murray 2000; Lehtonen 2004). In this paper, we confine our discussion to multiple, heterogenous, potentially conflicting resources of social, cultural, symbolic and economic kinds. However, we define the fields of the social, cultural and symbolic much as does Bourdieu, as involving, respectively, horizontal and vertical social relationships, including friendships, acquaintanceships, group memberships and social networks; knowledge, skills, attitudes, beliefs and objects obtained from families and educational and other institutions; and honour, prestige, recognition, and symbolic representation itself. 1.15 This research focuses on cultural-spatial patterns of living within London. However, London, as a global city, is often said, perhaps with some overstatement, to be more densely connected to other countries than are other UK cities and regions (Gordon 2011; Rogaly & Taylor 2009). We expected such connections to play some part in the visual autobiographies we studied. However, we use the term 'transnational', rather than 'global' or 'international', to describe cross-national connections, in order to foreground factors that these other terms neglect: the specificity of connections between particular countries; connections' heterogeneities and power imbalances; and the importance of local issues, cultural phenomena, migration histories and personal identities for urban cross-national connections (Bhabha 1994; Garbin 2008; Glick Schiller & Faist 2010; Lipschutz 1992; Smith & Eade 2008; Wetherell & Mohanty 2011). Smith and Eade (2008) have argued persuasively for the salience of migration, diaspora, history, and socio-cultural identities for urban transnationalism, and these are relevant focuses for our analysis. 2.1 The research began with four workshops led by Burman in summer and autumn 2009, in three geographically close but socially divergent Spitalfields locations: an art gallery; a study support centre for secondary school-age children, mostly of Asian origin; a Bengali cultural centre. 2.2 Eleven women and girls and eight men and boys, ranging from 10 to mid-50s, took part. Participants belonged to one of four groups. Five participants were parents and primary and secondary school-age children of white European ethnicity who attended the art gallery workshop. They lived outside Spitalfields and in the parents' cases, worked in professional occupations. Four participants were secondary school-age children from British families of Bangladeshi origin who attended the study support centre workshop. Data were not collected on parental occupations, which were anecdotally variable, although the participants lived locally, in areas marked by high levels of economic, social and health deprivation. Six participants were women of Bangladeshi origin, ranging from their 20s to their 50s, who attended the workshops at the Bengali cultural centre. These participants had a variety of occupations, including teaching assistantships and cleaning; some did not work outside the home; all lived locally. Finally, four participants were university students, of UK, other European and South Asian origin, who attended workshops across all locations. All had low incomes at the time, although their class backgrounds varied; all lived or worked in East London. 2.3 Ethical approval for the study was gained from the University of East London. It included CRB checks to enable working with the participants who were under 18, and a consent procedure which clarified for participants their rights to withdraw from any or all aspects of the research, and provisions for anonymisation of all images and interview data. Ethics was treated as a process, to be engaged with throughout the research. After the visual autobiography workshops, participants were asked again if they were willing to participate in interviews, and were then recontacted to finalise arrangements. Some workshop participants from the Bengali cultural centre were not interviewed; while they said they were ill at the time, another follow-up did not yield any appointment and further follow-up would have been coercive. Interviews were deliberately focused on the making of the images and participants' relations to art and other cultural activities, and avoiding probing personal issues, even though apparently unconnected issues of this kind may be raised by discussions of artwork. Against this possibility, some referral possibilities were on hand, though in this study they were not required. Display of images at the gallery exhibition was checked later with participants, and one image was withdrawn. In writing up the study, pseudonyms have been used and some inessential participant details have been changed to make participants non-identifiable. However, many participants were keen to be identified with their images and some have displayed them in their homes or on web pages, or have used them as a basis for their own writing (see also Esin & Squire 2013). 2.5 The workshops lasted up to four hours and the majority of participants spent this length of time on the process, with five returning for two workshops, and one scheduling a further short session. Two participants spent two hours and two, three hours on the process. With consent, notes and non-identifying photographs were taken during the workshop process to document how participants produced the images. 2.6 We called the research a study of 'visual autobiography'. By juxtaposing terms not usually conjoined, we wanted to encourage responses that were relatively free of artistic or literary expectations. The word 'autobiography,' used mostly in relation to writing, might when applied to visual art allow people to take a wider historical and relational approach to the visual than 'self-portrait' would permit (see also Esin & Squire 2013). 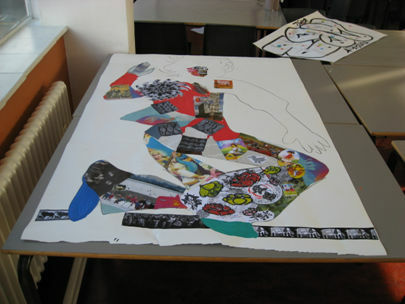 The collage medium also decoupled the project from traditional ideas about artistic skill and promoted openness in portraying identities (Luttrell 2003). In addition, the size and open-endedness of the work, its group nature and the interesting and attractive materials rendered the project enjoyable in a way that is rare in research. 2.7 One to four weeks after the workshops, all participants except the two who declined because of illness were interviewed by Squire, Esin, who had herself participated in a workshop, and/or another workshop participant who provided translation when one interviewee wanted to speak Bengali. Interviews explored why the participants had made the work they had, what they had included, what they had left out and why, effects of the materials, working in the group, and the body outline, and how participants might want to change the image or do things differently. Two interviews, involving a family of four, and four students from the study support centre, were joint, at interviewees' request. Two participants produced writing about the images. After each interview, demographic details were collected, field notes compiled, and interviewees received a cd of workshop images. 2.8 Burman curated an exhibition in a local community gallery, including all but one of the visual autobiographies. Later, because it was liked and popular, the gallery reconfigured it as a large window display. Many research participants came to the opening, field notes were made about their involvement, and they received exhibition catalogues. All images were returned to participants at the end of the study, along with some prints and photographs made for the exhibition. 2.9 Analysis adopted a narrative approach. We took 'narrative' to involve any meaningful successions of visual or verbal symbols, or actions performed within the larger activities of making and exhibiting art and participating in interviews. This perspective proved useful for addressing narratives appearing in different media that might otherwise have proved difficult to analyse together (Ryan 2004; Squire 2012b; Esin & Squire 2013). Our narrative approach also let us consider how participants took up varying cultural and social positions within their stories (Phoenix 2008; Taylor 2009). Addressing these positionings allowed us to understand something of participants' resources for living as urban subjects (Lawler 2008: 42). 2.10 Analysis addressed, for each participant, how they positioned themselves within London, within the three different modalities of narrative that the research yielded. First, we analysed the visual narratives articulated within and across the autobiographical images, and in many cases corroborated or explained in the interviews. Second, we analysed interview narratives of how the images came about and what they meant. Third, we analysed activity narratives, derived from our field notes about and photographic records of how participants came to the workshop, made the images, and engaged with the interview and exhibition. In conducting the analyses, we focused particularly on the 'visual autobiographies'. We adopted this focus partly because these images were at the centre of the workshops and exhibition and were the most salient aspect of the research for participants. In addition, we chose this focus because of recent narrative work on the importance of the visual in displaying and developing identities, for instance, in Luttrell's (2003, 2010) research on young pregnant US women's self-portraits and US migrant children's photography (see also Radley 2009). Many other studies also suggest that more and different data derive from participants who engage in cultural activity within research, than from participants simply responding to researchers' questions (Back 2007; Kaptani & Yuval-Davis 2008; Reavey 2011). Because the images were autobiographical, included strong figurative elements, and were accompanied by notes about their making and exhibition, and by interviews, it was, in addition, easier to analyse them narratively than is the case with less-contextualised still images, whose narrative characteristics may be debatable, their storylines capable of multiple interpretations, or both (Harrison 2002). 2.11 The stories addressed in the analysis display varying forms of narrative organisation: spatial, conceptual, physical, chronological. We discuss these different kinds of narrative organisation elsewhere (Squire 2012b; Esin & Squire 2013). The stories also have many themes such as family, education and work, friendship, travel, personal development, and becoming an artist which we cannot address fully here (see also Squire 2012a; Esin & Squire 2013 ). In what follows, we focus on the themes of narrative positioning in the city and the world, although, as with other thematic categorisations, some overlap inevitably exists with other themes (Braun & Clarke 2006). 2.12 The narrative thematic analysis performed here can be regarded as a subcategory of both narrative and thematic analysis. Following contemporary practice (Riessman 2008; Squire 2008, 2012b), we describe the narrative themes that we have identified in our material as involving common successions of themes, constituting common storylines within the activities, images and/or words in our data. We distinguish these narrative themes from themes understood more broadly, which do not necessarily have any narrative organisation (Braun & Clarke 2006; Riessman 2008; Squire 2008, 2012b). We also investigate the immediate and broader contexts of these thematic narratives (Davies & Harre 2009; Taylor 2009). We examine how, in their themes and contexts, the narratives of cultural-spatial positioning parallel or break with participants' socioeconomic positioning; the resources for urban living expressed and in some cases developed by the narratives; and their transnational positionings. 3.1 Despite the city's clear presence in the research's title, adult participants' images rarely showed their urban lives. They were more occupied with the 'global' than the 'city' elements of the 'global city'. However, the city figured strongly in children's visual autobiographies, particularly in the study support centre workshop. 3.3 Postcodes were strong concerns for the three boys in this group, but the girl also included postcodes in her image and talked about them. These participants were academically-oriented children who spent a large proportion of time outside school at the study centre. They were, nevertheless, very familiar with 'postcode' identities and conflicts. While they were making the images, they repeatedly promoted their own postcodes and denigrated those of their friends, jokingly calling praises and insults across the artroom. The interviews, done with all the children together, featured similar verbal jousting. Yet the images were also collaborative visual narratives, bringing in names of friends from other postcodes – including workshop friends who contributed their own tags – usually around the edges of the image, analogously to their geographical locations. The images thus made explicit participants' complex sociospatial identities, some of which were being developed at the centre itself, where they established friendships with children from different areas. A centre worker, observing the workshop towards its end, tried to strengthen this complexity by suggesting that participants make a collective graffiti'd 'centre' image, to which all enthusiastically contributed. 3.4 The research process also seemed to expand participants' identity possibilities by allowing them to position themselves as artists. They spent a great deal of time extending and perfecting their everyday practises of graffiti writing – which usually occurred on smaller scales, with less attractive materials, and more briefly – sometimes as a covert diversion from schoolwork. 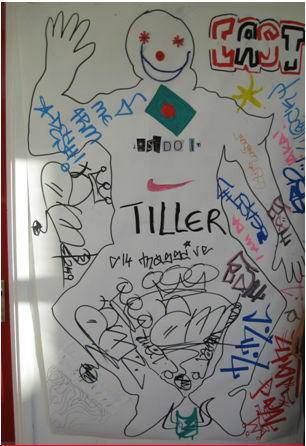 The large visual autobiographies requested for the research led to them making further graffiti pieces within the workshops. At day's end, they deliberated as artists over their 'best' pieces. Figure 4. Anwar (in process). Anwar: I just done it, to express myself. Well basically what happens in, when you go to different areas and people are like, how, how can you be safe....Yeah that's the red bullets, it shows, as in around London, wherever you go, people are getting killed, stuff like that. I drew the stars to show black eyes, so yeah, it's like you're knocked out, have you seen some animations/oh yeah/yeah, when you get knocked out, you start seeing stars...it's to show how people can be more careful, and not end up like that. Anwar: I think when I just look at this yeah, it feels like, there's other stuff in life you could do instead of hanging around with a group of people, who ain't gonna get you through anything, in a way, as in, everyone needs education, to become someone...it might be fun to do, but yeah, you feel like, instead of staying with them, or staying with them sometimes, say, once every two-three days, that's alright, but not everyday. Anwar attended the whole of the exhibition opening, standing in front of his image, explaining its making and meanings to visitors. Through the interview, and these later activities, he thus narrated a wider positioning for himself in the city, as a young, socially critical, artistic Londoner, than his localised visual autobiography claimed. He generated for himself the new, albeit perhaps temporary, social resources of the gallery and its attenders, as well as perhaps a more general symbolic resource: that of his identity as a subject with a future outside of the 'just hanging around' constraints of his local life (see also Squire 2012a). 3.6 Anxieties about 'postcode violence' can operate, like other crime fears, as standins for many other concerns around poverty, youth, 'race,' and religion, both in popular media, and for people who live outside or even within at-conflict postcodes. They can be part of an imaginary cultural or political landscape (Alexander 2008) rather than a lived one. However, the lived texture of urban dangers for these participants was indicated by the centre offering winter escorts home for younger children and girls, and by one child's report that another participant was mugged for his phone outside his area, around the time of the exhibition. The children's visual-autobiographical portrayals of themselves within constrained though contested E1's and E14's 'of the mind,' seemed, then, close to their lived, socio-spatial East Londons. 3.7 The children who participated in the art gallery workshop, visiting from higher-income areas, pictured a differently divided London. They knew about 'postcode' identifications, but did not represent them; they positioned themselves within a larger, at first sight unified city. However, in both images and later interviews, these children also included fragmented and contested aspects of their urban lives. 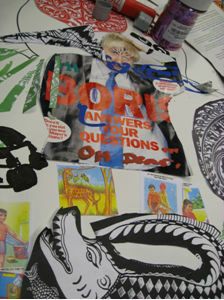 Ed, for instance, a 13 year old boy, put, early on, at the middle of his image, a cut-out face of the controversial Conservative mayor of London, Boris Johnson, drawn on and part-obscured. He returned to this image in the interview; in a later short piece of writing, he said: 'I found a picture of Boris Johnson on a Time Out cover and decided to use it as the centre piece.' Through this image, Ed positioned himself within a city divided politically, rather than by postcode. Difficult aspects of urban life were different for Ed than for Anwar and Kabir, less overtly dangerous. Yet the defaced Johnson is a hostile as well as comic figure. It also positions Ed as an active, young, politically engaged Londoner. This positioning indicates considerable critical cultural resources, well beyond the critical social resources likely to be available to a person of this age. Such resources are likely to have pre-dated the workshop. However, Ed's concentration on critical urban positioning in his interview and written reflections suggests that, as with Anwar, such resources may have been strengthened by his work on the image. 3.8 Adult participants' cultural-spatial positioning within the city was not much evident in their images, but appeared in their interviews and in processes of image production. For example, all the adult art gallery and student participants said they knew, or knew about the workshop gallery, exhibition gallery or the artist herself beforehand. These participants, despite diverse employment categories and incomes, showed in Butler and Robson's (2001) terms the extended socio-cultural networks characteristic of London's middle classes. Their urban cultural-spatial positioning was in 'London', not 'East London', still less specific neighbourhoods. Such apparent cosmopolitanism crossed class positions. Notably, students' broad knowledge of and access to urban cultural life contrasted with, and may have offered additional resources to, their constrained socioeconomic realities. Fatima's later involvement with the research repeated this story: she was the only participant from the Bengali cultural centre to attend the exhibition opening; she brought family members to the opening and was photographed in front of her image. Fatima's repositioning of herself through this research as an artist as well as a wife and mother, situated her as an educated and creative subject, calling up and extending cultural and symbolic resources which had been underused in her life for some years and that were not obviously associated with her social positioning. 3.10 So far, we have only considered participants' cultural-spatial lives in relation to the cultural activities involved with this research. This is a restricted perspective. Fatima's research involvement, for instance, could be said, rather than repositioning her socio-culturally, to exemplify an already sophisticated cultural positioning within the city. Fatima, and other women who participated in workshops at the Bengali cultural centre, already took part in classes there. It probably made sense for most such participants to continue attending events at this highly valued centre that matched their own sense of city culture, rather than to engage with the lesser-known and not obviously more interesting cultural venue of the exhibition gallery. 3.11 We would also be thinking narrowly if we treated the exhibition non-attendance of all but one child participant from the study centre workshop as a 'failure' of cultural engagement. These children's limited abilities to move about London on their own might have been partly responsible. Perhaps as significant, was that their visual autobiographies were exhibited at the study centre and, they reported, via phone and social media photographs, and at home. Possibly such engagements worked best for these child participants because they focused on the children's sense of the city. Exhibiting images in spaces where they spent a great deal of time with friends and family, and distributing them virtually, themselves, could enhance social and symbolic resources in some quite concrete ways, via other children's and family members' responses to their work, 'likes' for their Facebook pictures and forwarding of their phone images. 3.12 Children from the art gallery workshop also proudly exhibited their pictures at home - but in addition, all attended the exhibition opening, with their parents. This difference in cultural activity seemed very largely the result of doing one workshop in an art gallery, to which children are almost always brought by adults, with home-based follow-up interviews; and another workshop, with accompanying interviews, in an after-school study centre, which does not usually contain parents. We saw more of children's cultural cities in the study centre group, and more parent-inflected cities-for-children in the art gallery group. If we had involved the study centre children's parents in the research, or if the children at the gallery workshop had attended a school-based workshop, the pattern of later participation might have been very different. 3.13 In Figure 1, at the centre of Kabir's visual autobiography, is a Nike image, painstakingly constructed to match almost exactly the image on Kabir's T shirt; above it is the Bangladeshi flag. Like Kabir, many children collaged in flags related to family origins, international, locally popular brands, and other internationalised cultural signifiers, especially Asian pictographic writing, which has strong currency for UK children via comics and animations. Adult and child participants alike included many images from places of origin and travels outside the UK. 3.14 These transnational positionings were by turns tied to dominant cultural formations, and set against them. They sometimes fitted with, but sometimes extended research participants' socio-spatial positions, indicating cultural and symbolic resources beyond those which might have been expected. They were also rooted in specific urban resources, in a kind of transnationalism 'from below' (Smith & Eade 2008), Children's graffiti, for example, invoked a cultural arena much wider than their 'postcode' social referents, and positioned their makers as 'glocalised' hip-hop artists (Mitchell 2001). The children were aware of the form's international currency and US origins – but they also said the graffiti drew on local images on walls and hoardings. The most intensely transnational autobiographies were made and told by students, based within and outside the UK. Alice: I put elephants, it's, it's, it's the world that is going, so I'm walking on the world, I'm trying, I'm trying to explore the world...Here's there's Mongolia...and there's Russia there on the other leg/yeah, yeah/I put them at the beginning because I speak Russian and I went to Russia several times, I like this kind of landscape (laughs), old, old factories...I really like this play (equipment) for children, I think er in all, all eastern European countries you find the same one, same colour, red, blue, yellow...in east Germany, in Ukraine, in Budapest. Alice tried to include in the image the diversity of the places she had visited and wanted to visit, and used the Asian images that were a feature of Burman's materials to narrate what she said, laughing, was a kind of Indianised version of herself. Alice thus converted her existing social resources as a world traveller into cultural resources by representing them visually and in the interview, and imaginatively extended these resources to produce a new one: a visual autobiography grounded in transnationalism. Alice's urban cultural positioning in London offered the ground for this extension. She deployed the transnationalism of her current location within 'global' London as the basis to explore her own transnationalism. It was, indeed, the transnational aspects of London that had brought her there to live and work. 3.16 Alice's transnationalism was, again, critical. She positioned herself not as an exoticising flaneur, free to travel the world, but as someone convivially engaged with transnational differences (Gilroy 2004): 'I speak Russian…I really like this landscape…old factories…and play equipment'. She ironised her collaged 'Indianness', and described the multicultural elements of her image as things that were like her, or that she liked: a two-way process of narrative transnational connection in which she was claimed by, as well as claiming, the things that made her. 3.17 Transnationalism was also critically articulated by younger participants. Ed drew over corporate images to make them his. Faisal, an 11 year old at the study centre workshop, wrote the words of Mohammud Ali, 'float like a butterfly, sting like a bee', explaining them meanwhile, alongside his image. Then, seeing friends' bricolages of multinational brands, he searched for a branded wrapper from his favourite local, E1 fast-food shop to stick on (the 'chicken' label visible towards the top of Figure 9). Such critical and locally-grounded transnationalism indicates strong cultural resources: complex political and ethical understandings in children, as in adults, and symbolic resources: participants' authority to declare the meanings of their urban lives. Such resources were, once more, made visible and perhaps, especially for the child participants, enhanced, by the research processes. 3.18 Another form of critical transnationalism emerged around family histories. Children at the study support centre all represented parents' or grandparents' origins in countries outside the UK by picturing those countries' flags. Comments during the workshop indicated such familial transnationalism was part of the children's present social resources, via occasional visits and other regular communications. However, in the images, familial transnationalism appeared as a literally central cultural resource, with flags one of the first images included, as with Bushra (below), or placed in the middle of children's bodies. This centrality did not emerge in interviews, nor would it have shown up in observations of the children's day-to-day lives. The visual centrality of these familial-transnational identifications, despite their everyday invisibility, meant that this form of transnationalism also operated critically, against narrower understandings of international connection. Alice: My grandmother used to like yellow roses, I like red roses, and those pink roses, it's the garden of my mother...this picture, it's my brother and me, and here, I've put, it's my best friend and me. She then moved on to locate in other areas, using different materials, the varied landscapes and elements of human culture that signified her travels to other countries. 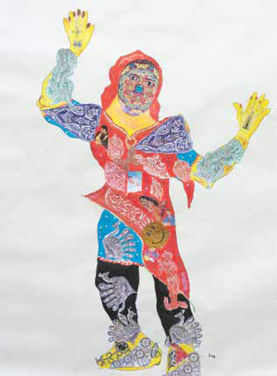 3.20 All of the Bangladeshi-origin women who attended the cultural centre workshops collaged their body images largely from elaborate abstract South Asian designs, which they cut out, coloured and decorated. 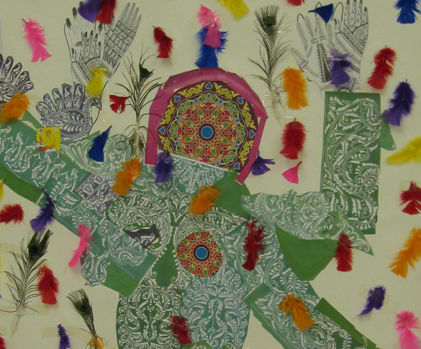 Hasina and Amina, for instance, two women in their 20s and 50s, made a collaborative image with doubled arms, which they first filled out this way, before overlaying the image with feathers, particularly peacock feathers, a material that some of the women said had strong social and cultural resonances for them. The Asian patterns and the peacock feathers were used by other research participants too. However, these women's strong aesthetic choice expressed a continuing identification with South Asian culture, rearticulated within East London. It demonstrated, and developed, the cultural resource of participants' existing aesthetic knowledge, and the new symbolic resource of their ability to make art of a different kind than that usually produced at the centre. Fatima: This was my first art in the UK. I was in Bangladesh when I was a student and did college, then I (did) art...in collage and school, long long time (ago), 10 to 15 years (laughs), UK, (this is) my first art in the UK. Fatima's cultural activity during the research thus expresses and develops cultural and symbolic resources rooted in her migration history, but not aligned with her current social resources (see also Squire 2012a). 4.1 This research indicates that cultural-spatial and socio-spatial positionings had double relationships, sometimes interconnected, sometimes importantly disconnected, in these narratives produced through cultural activities. First, there were some clear connections between participants' social and cultural positions. Child participants at the study support centre, like Anwar and Kabir, pictured and described the localised, 'postcoded' shape of their worlds in ways that seemed close to their everyday social lives. Visual and spoken narrations of cultural transnationalism, like those of Kabir, Alice, Hasina and Amina, and Fatima, were closely associated with social activities such as migration and return visits, study abroad and holidays. Such convergences point to the value of examining cultural alongside social positionings, as narrative and arts-based community research increasingly does (Luttrell 2010; Kaptani & Yuval-Davis 2008). 4.2 A second implication from the study is that socioeconomic status will not always relate closely to participants' narrated cultural urban lives, which here seemed at times more shaped by migration, student status and childhood, than by socioeconomic group. This does not mean that class, minoritised ethnic status, national origin and religious affiliations were not more broadly salient. However, critical transnationalism, expressed through the interrogation of international brands, was visually and verbally related to children's experiences of consumption, across socioeconomic and racialised categories. Participants with backgrounds including educational or familial migration marked this transnationalism visually, in ways not necessarily differentiated by socioeconomic status. Students, educationally but not economically middle class, seemed, regardless of class or national background, enabled by the city's easily negotiable physical environment, jamming classes up against each other, and by the multiplicity and openness of many urban cultural formations, to autobiographise themselves and to some extent to live within, a wide ranging cultural world. Studies of the severe effects of youth unemployment (Prince's Trust 2010), of which Tower Hamlets has one of the highest UK levels, suggest the potential significance of such mobile cultural positionings for young people. The impact on such possibilities of UK higher education's new finance structure is not yet clear. Finally, being constituted as 'artists' by the research meant that child, migrant and student participants, who were all economically constrained, could display and develop expanded cultural-spatial maps of the city, to some extent independent of their socioeconomic status. 4.3 All this does not mean that the convergences between cultural and socioeconomic life patterns often noted (Le Roux et al. 2008) did not apply for our participants, but rather, that the fine grain of this study showed up areas of divergence. Third, this research provided evidence of divisions between cultural-spatial positions, like those Butler and Robson (2001) saw between socio-spatial positions. However, the divisions operated between postcodes, age cohorts, and migration histories, rather than socioeconomic groups. Child study centre participants' East Londons 'of the mind' were the research's most notable instances of divided cultural-spatial positionings. The children's image-making, interviews, and processes of taking part in the research and exhibition were all shaped by perceived and actual 'postcode' dangers, showing their restrictive yet 'complex and contradictory' placement within contemporary cities (Christensen & O'Brien 2002: 2; Holloway & Valentine 2000). Morevoer, child participants, as well as women participants at the Bengali cultural centre, articulated specific cultural worlds, focused on school and home in the first case, and on a specific national cultural heritage in the second. These cultural worlds were not apparently related to socioeconomic status (Hallden 2002). 4.4 Such divisions between patterns of cultural activity point up the value of treating cultural alongside social intersectionalities, and of recognising conflicts between positionings (Crenshaw 2003; Mouffe 2005). Such conflicts can appear between cultural positions, as when E1 and E14 participants confronted each other aesthetically across the paper spaces of the images, or between cultural and social positions, as when women migrants such as Fatima position themselves culturally in ways that do not jibe with their socio-spatial worlds. 4.5 The study shows that, as other researchers have found, cultural, symbolic and social resources for urban living can be expressed and developed through cultural activity (Luttrell 2003, 2010; Kaptani & Yuval-Davis 2008). Anwar, for instance, self-consciously translated his visual autobiography into a story which generated new cultural, symbolic and social resources. Alice used the research alongside her new positioning as a London student to develop her travelling life story into new cultural and symbolic resources of critical transnationalism. The women at the cultural centre workshops who used Asian-origin images in their collages, and the children at the study support centre workshop who extended their identities as graffiti artists, similarly deployed and developed cultural and symbolic resources through the research processes. The cultural activity involved in the research allowed expression and expansion of at least some resources not visible in more socially-oriented research, or supported by everyday social lives. 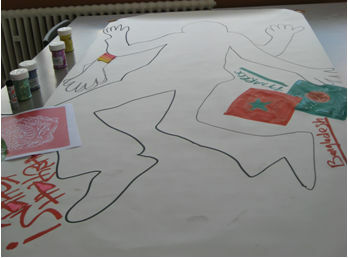 The cultural resources that participants developed were also critical at times, as in the cases of Anwar, Ed and Fatima. Perhaps the kinds of cultural activity that this research involved had some of the potential shown by more formal cultural work to 're-moralise', allowing people to adopt oppositional and active social positionings (Banks 2007). 4.7 Our highly particular research sites and limited time with participants constrains what we can say about such resources. Longer-term, ethnographically-oriented research (Luttrell 2003, 2010) generates a fuller picture. However, this project's time and resource constraints characterise those of much contemporary research on cultural activities. 4.8 Our research choices also affect findings about positioning (Kalra et al. 2005). Gender, age, socioeconomic class, ethnicity and religion were not explicit concerns and participants rarely mentioned them directly, though complex intersectional positioning were likely in play. For instance, the local positionings worked through collectively by the young men at the study centre may also have negotiated sociocultural masculinities in ways similar to those described by Frosh and colleagues (2002). Perhaps, too, the artworks made by some women in the Bengali cultural centre extended their positionings within this cultural tradition as do other activities explicitly designed for Bangladeshi-origin women in this area (Begum et al. 2011). 4.9 As in Back's (2007) research, cultural, symbolic and social resources appeared in this qualitative study of cultural activity as powerful but unpredictable and complex. Such difficulties vitiated our decision to discuss 'resources' heuristically. To map the complexities of resources by developing a 'weak' pragmatic analysis (Lehtonen 2004) of them turned out to be more fruitful, practically and theoretically, than adopting a strong social capital framework. 4.10 In this study, transnationalism appeared as intrinsic to cultural-spatial positionings in the global city, demonstrating important and varied types of connection with the rest of the world, as Massey (2007) describes. The cultural activities of the research seemed to enable such transnationalism's expression, for example for Fatima, who mobilised resources she had last deployed in her country of origin many years earlier. Unlike Rogaly and Taylor (2009), working in a smaller city, we found no intra-national, references in the material we studied, supporting the suggestion that global city cultures' relation to transnationalism is a highly specific one (Gordon 2011). However, this finding may have related partly to a project title foregrounding London, and to the nationally and culturally diverse art materials made available to participants. 4.11 The research indicated widespread, varying and sometimes overlooked types of transnational positioning, shaped by leisure and consumption, but also by migration in pursuit of education, and long-maintained family histories. Transnational cultural-spatial maps were large, but also related to local imaginings of the world. Children imitated neighbourhood tagging to tie into global graffiti practices, for example, while articulating these practices around postcode identities and restrictions. These autobiographies indicate a transnationalism rooted in and intrinsic to participants' urban lives (Smith & Eade 2008). For many, this was also the transnationalism-'from-below' of everyday lived diaspora (Piertese 2009). Its familial grounding underlined the emotional significance of crossnational links (Skrbis 2008) rather than the social and economic resources with which such links are often associated (Garbin 2008). Participants' transnational positioning also often allowed them to articulate or develop critical cultural resources, and consequent symbolic resources as ethical and political subjects. 5.1 The expression and cultivation of cultural, symbolic and social resources through cultural activity is not much researched. Our study indicates that, as others have suggested (Kaptani & Yuval-Davis 2008) there could be a stronger role for cultural activities in the global city, in both research about and enhancement of people's resources, and that considering resources in a heuristic way, based on detailed narrative data, can be a useful way to comprehend how such activities work. Here, for instance we were able to discern the cultural-spatial urban positionings of children, students and migrants as meshing with but also importantly different from these participants' socioeconomic positions. It also seemed that resources that were not immediately evident, such as those related to children's, women's and students' positions in community organisations, families, schools, migration histories, and transnational networks, and as artists, could be acknowledged and developed through cultural activities. 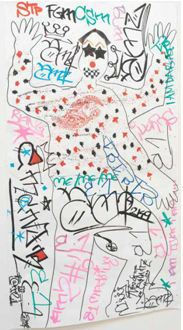 Often, they appeared in visual autobiographies and the activities of making and exhibiting art, not within interviews. Other cultural activities (Back 2007; Begum et al. 2011; Luttrell 2010) might have similar effects; visual autobiographies, however, might be especially fruitful for participants who are not fully paid up members of Plummer's (2001) 'autobiographical age' because of some generational or linguistic distance from it. 5.2 Cuypers and colleagues (2012) emphasise the importance of cultural activities for men and more particularly women, in health terms. Such activities could be given more emphasis in community-based programmes in under-resourced areas (see also Ings et al. 2012). Like Luttrell (2003, 2010), we do not want to be overoptimistic about the difficulties of interpretation, accountability and effectiveness in this kind of work. However, we would suggest that community-based cultural activities can provide for very productive kinds of self-positioning. More broadly, they are especially good at enabling the articulation and development of cultural, social and symbolic resources, because they are more fluid and wide-ranging than the practices of conventional research or, indeed, of much of everyday social life. 1C. Esin had a Leverhulme Artist in Residence grant for this work; we thank the Leverhulme Foundation for their support. ACKROYD, P. (1995). Dan Leno and the Limehouse golem. London: Vintage. ALEXANDER, C. (2000). The asian gang. London: Berg. ALEXANDER, C. (2008). Re-imagining 'gangs'. Joseph Rowntree Trust. ALEXANDER, C. (2011) 'Making Bengali Brick Lane', British Journal of Sociology, 62(2) p. 201–220. ALI, M. (2003). Brick Lane. London: Doubleday. BEASLEY-MURRAY, J. (2000). 'Value and capital in Bourdieu and Marx', in Brown, N. & Szeman, I. (Eds), Pierre Bourdieu: Fieldwork in Culture (pp. 100–119). Lanham, MD: Rowman and Littlefield. BEGUM, S., Cudworth, E. & Tamboukou, M. (2011). 'From sewing to speaking: revisiting the public/private dichotomy with "workless" Bengali women'. Poster presentation, UEL, October 2011. BENNETT, T., Savage, M., Silva, E., Wardle, A., Gay-Cal, M. & Wright, D. (2006) Media culture. London: BFI. BOURDIEU, P. (1986). The forms of capital, in Richardson, J. (Ed), Handbook of theory and research for the sociology of education. Westport, CT: Greenwood. BRAUN, V. & Clarke, V. (2006). 'Using thematic analysis in psychology', Qualitative research in psychology, 3(2), 77–101. BUTLER, T. & Robson G (2001) 'Social capital, gentrification and neighbourhood change in London: a comparison of three South London neighbourhoods', Urban Studies, 38 p. 2145–2162. CHRISTENSEN, P. & O'Brien, M. (2002) Children and the city. London: Routledge. CRENSHAW, K, (2003) Traffic at the crossroads: multiple oppressions', in Morgan, R. (Ed), Sisterhood is forever: the women's anthology for a new millennium. New York: Washington Square Press. CUYPERS, K. Krokstad, S., Holmen, T., Knudtsen, M., Bygren, L. & Holmen, J. (2012) 'Patterns of receptive and creative cultural activities and their association with perceived health, anxiety, depression and satisfaction with life among adults: the HUNT study, Norway', Journal of Epidemiology and Community Health, 66(8) p. 698–703. DAVIES, B. & Harr�, R. (1990). 'Positioning: the discursive production of selves,' Journal for the Theory of Social Behavior, 20(1) p. 43–63. ESIN, C. & Squire, C. (2013) 'Visual autobiographies in East London', FQS, 14(2) Art. 1. FROSH, S. Phoenix, A. & Pattman, R. (2002) Young masculinities: understanding boys in contemporary society. Basingstoke: Palgrave. GARBIN, D. (2008) 'A diasporic sense of place: dynamics of spatialization and transnational political fields among Bangladeshi Muslims in Britain', in Smith, M. & Eade,~J. (Eds), Transnational ties: cities, identities, and�migrations. New Brunswick and London: Transaction Publishers. GENTLE AUTHOR (2012) Spitalfields life. London: Saltyard Press. GILROY, P. (2004) After Empire. London: Routledge. GLICK SCHILLER, N. & Faist, T. (2010) Migration, development and transnationalization: a critical stance. London: Berghahn Books. GORDON, I. (2011). 'London: capital of boom and bust? ', Observatoire de la soci�t� britannique: la revue, 11 p. 69–88. HALL, S. (1993) 'Cultural identity and diaspora', in Williams, P. & Chrisman, L. (Eds), Colonial discourse and postcolonial theory: a reader (later edition 1999). Hemel Hempstead: Harvester Wheatsheaf. HALLDEN G. (2002) 'Children's views of family, home and house', in Christensen, P' & O'Brien, M. (Eds), Children in the city. London: Routledge. HARRISON (2002) 'Photographic visions and narrative inquiry', Narrative Inquiry, 12 p. 87–111. IMRIE, R., Lees, L. & Raco, M. (2009) 'London's regeneration', in Imrie, R., Lees, L. & Raco, M. (Eds), Regenerating London. London: Routledge. INGS, R. Crane, N. & Cameron, M. (2012) Be creative, be well: arts, wellbeing and local communities. An evaluation. Arts Council England. KALRA, V., Kaur, R. & Lutnyk, J. (2005) Diaspora and hybridity. London: Sage. KLANDERMANS, B., van der Toon, J. & van Sekelenburgh, J. (2008) American Sociological Review, 73(6) p. 992–1012. LAWLER, S. (2008) Identity: sociological perspectives. Cambridge: Polity. LE ROUX, B., Rouanet, H. Savage, M. & Warde, A. (2008) 'Class and cultural division in the UK', Sociology, 22 p. 1049–1071. LICHTENSTEIN, R. & Sinclair, I. (2000) Rodinsky's room. London: Granta. LUTTRELL, W. (2003). Pregnant bodies, fertile minds. New York: Routledge. LUTTRELL, W. (2010) '"A camera is a big responsibility": a lens for analysing children's visual voices', Visual Studies, 25(3) p. 224–237. MASSEY, D. (2007) World city. London: Polity. MCLEAN, C. & Kelly, R (2011) Creative arts in research for community and cultural change. Calgary: Detselig Enterprises. MITCHELL, T. (2001) Global noise. Middletown, CT: Wesleyan. MOUFFE, C. (2005) The return of the political. London: Verso. PHOENIX, A. (2008) 'Analysing narrative contexts', In Andrews, M. & Squire, C. (Eds), Doing narrative research. London: Sage. PHOENIX, A. & Pattynama, P. (2006) 'Intersectionality. Special issue on Intersectionality', European Journal of Women's Studies, 13(3) p. 187–192. PLUMMER, K. (2001) Documents of life 2. London: Sage. RADLEY, A. (2009) Works of illness. Ashby de la Zouch: Inkermen Press. REAVEY, P. (2011) Visual methods in psychology. London: Routledge. RIESSMAN, C. 2008. Narrative methods for the human sciences. New York: Sage. RYAN, M-L. (2004) Narratives across media. Lincoln, NB: University of Nebraska Press. SASSEN, S. (2001) The global city. Princeton, NJ: Princeton University Press. SCOTT, S. (2011) 'If the rioting was a surprise, people weren't looking', Guardian, 8 August. <http://www.guardian.co.uk/commentisfree/2011/aug/08/tottenham-riots-not-unexpected>�(accessed 25 June 2013). SHAW, S. (2011) 'Marketing ethnoscapes as spaces of consumption: Banglatown – London's Curry Capital', Journal of Town & City Management, 1(4) p. 81–95. SKRBIS, Z. (2008) 'Transnational families', Journal of Intercultural Studies, 3 p. 231–246. SMITH M. & Eade, J. (Eds) (2008), Transnational ties: cities, identities, and�migrations. New Brunswick and London: Transaction Publishers. SQUIRE, C. (2008) 'From experience-centred to culturally-oriented narrative research', in Andrews, M., Squire, C. &Tamboukou, M. (Eds. ), Doing Narrative Research. London: Sage. SQUIRE, C. (2012a) 'Narratives and the gift of the future', Narrative Works, 2(1) p. 67–92. SQUIRE, C. (2012b) 'What is narrative? ', National Centre for Research Methods Working Paper. <http://eprints.ncrm.ac.uk/3065/> (accessed 20 June 2013). WALBY, S., Armstrong, J. & Strid, S. (2012) 'Intersectionality: multiple inequalities in social theory', Sociology, 46(2), 224–240. WETHERELL, M. & Mohanty, C. (2012) The Sage handbook of identities. London: Sage. WILSON, A. (2006) Dreams, questions, struggles. London: Pluto. YUVAL-DAVIS, N. (2006) 'Intersectionality and feminist politics', European Journal of Women's Studies Special issue on intersectionality, 13(3) p. 193–209. ZUKIN, S. (1989) Loft living. New Brunswick, NJ: Rutgers University Press.